This simple pattern is for a basic leaf shape. You could use them as broaches, or decoration for an autumn wreath. The possibilities are limited only by your imagination. This pattern is for a vintage inspired Christmas tree decoration. This snowman tree hanger is quick to knit so you could easily make a collection for your tree. This is a nice simple pattern for a pumpkin pincushion. It uses small amounts of double knitting yarn. This fun pattern is for a Halloween figure. This is a nice simple pattern for an autumn inspired apple pincushion. This is the pattern for Sidney the Squirrel as he appears in my book ‘A Year in Woolly Wonders’. This pattern is for a cardigan to suit the creatures in my knitting book ‘A Year in Woolly Wonders’, including Patrick the Frog who is also available in my Ravelry store. 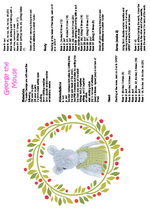 This is the pattern for George the mouse as he appears in my book ‘A Year in Woolly Wonders. Part of my Woolly Wonders range of creatures, Patrick is a friendly frog who loves lazing around on lily pads and dangling his feet in the water. This is a pattern for a small string basket which could have many uses around the home. This is a fairly simple pattern using double and treble crochet.